HyperConomy is the all in one economy and shop plugin. It can be a simple chest or sign shop plugin, a Vault compatible economy plugin, a region based shop plugin with many configurable options, or even a complex system of economically competing towns and kingdoms. Any vanilla Minecraft item can be traded in HyperConomy and virtually any custom item can be added as well. Prices can be configured to change dynamically or they can be set as desired. To quickly edit prices and settings you can double click on HyperConomy.jar to access the GUI editor. HyperConomy has many features including things such as item price linking and item displays. Read below or check out the wiki for more information. Supports the addition of unlimited custom items. Player to player, player to shop, and shop to player trading. Dynamic pricing system based on a hyperbolic curve. Player owned shops and chest shops. GUI Editor for easy manipulation of price settings. Price floor, price ceiling, static pricing, initial pricing, sales tax, purchase tax, unlimited stock option and much more. Allows the creation of an unlimited number of economies, which allows for economically competing towns, kingdoms, factions, or other groups. Supports command-free economies using transaction signs and chest shops. Price information, history, and more can be displayed on automatically updating information signs. Price update notifications for any or all items. When a player enters and leaves a shop, HyperConomy displays a customizable message. Nearly everything can be changed while the server is running. Unwanted features can be disabled. Recommended builds are marked with [RB] and are generally thought to be stable and bug free. Builds marked as [Beta] are as bug free as possible, but often have large code changes which may result in the appearance of new bugs. Builds marked as [Dev] are development builds that I've decided to upload to BukkitDev. I may upload dev builds on occasion to provide easy access because Bukkit staff does not allow linking to development builds. Development builds may contain bugs as I work on releasing a new [Beta] build. They may also contain fixes for bugs found in [Beta] builds. Use these builds if you're looking for a bug fix, or would like to try out a new feature I've just added. Also, feel free to search for bugs in the development builds. Any help with testing is greatly appreciated! The latest development builds can be found here. HyperMerchant is a graphical user interface for your players to use to interact with HyperConomy shops. It is also includes the ability to easily create Citizens npc shopkeepers for your HyperConomy shops. 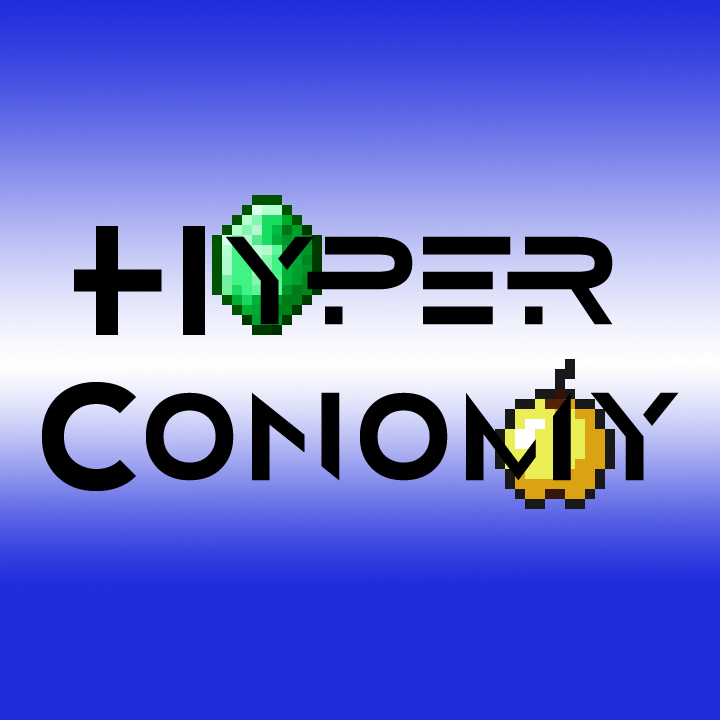 HyperConomy Web creates a web page for HyperConomy, displaying information about all shops, items, and price history. The web page appearance can be customized to fit your server. New Features, Bugs, Problems, etc. If you have a question, or find a bug, first check the FAQ. I will try to include as many helpful questions and answers as possible. If the FAQ doesn't help, don't hesitate to post your question or make a ticket. If you do find a bug, please include which version of HyperConomy you're using, the full error message or stack trace (if there is one), the version and type of Minecraft server you're running, and an explanation of how to reproduce the bug or what causes the bug. To those who have donated: thank you very much for the support. If you'd like to be listed as a donor here just send me a message. Thanks as well to all of the other donors that haven't requested a listing here. I still would like to update this when I have time, but I can't promise that it will be in the next few weeks. I've had no time to work on it recently, and it's not going to get better for a few more weeks. I'll be traveling out of the country. Hopefully, when I'm back I'll have time to get everything up to date again. Sir I got a few questions. 1. Why dont you update your Spigot HyperConomy Plugin area? 2. Also when is the Premium NONE lite coming to Spigot? 1. Can I set EVERY price per item in the world based on the Items Name, Item Type and if its a unique version of that item? There is also a More common "Saving Grace" that's stone only but id like that one to be only a few dollars more than a default stone sword and id like these Set prices to fluctuate based on supply and demand to the world market and the amount sold to the stores and bought from the stores as well. 2. Id also like to some how have NPC' Citizen fluctuate the market prices very very lightly based on what they want to decide to buy that weak or etc of a few items. 3. Is it possible to set up "server stores" but dont have infinite items to sell? Id like to refill the chests but then have a "Grand Exchange" have its own bank currency that wouldn't be mine just so they can distribute cash and etc. Lastly before I go your link in your Youtube video is not working. Also Please post and check spigot more its used more often in my opinion Sir Also keep up the great work. In the POM file, both of these are addressed, obviously, and both are referenced correctly as far as I can tell. I'm running the most recent dev version (0.957.7) on Minecraft 1.11.2. 1. Beetroot and Beetroot Soup aren't being recognized by the plugin. 2. The sell prices for some items show up as $0 when there are 0 of the items in stock, or at intervals of 64. Firework Rockets, Elytra, Lingering Potions, Potion Tipped Arrows, Dragonsbreath, and more. I get a crash when i moved my server to a new dedicated server. Uh, im using the latest version of this plugin but when I try to add anything to a playershop it works but the shop doesnt show anything? Great plugin otherwise an I don't really want to revert back to essentials eco. Any help please? Is there a way to make just a singular global shop that is the only shop/economy on the whole server without having to set its borders so you can sell items in the same shop in the nether/end/overworld? item display is not working correct. item disapears if i place a block on the place the item is displayed it shows up for e few minutes and is gone again. Is there any way to make it where you can only sell or only buy specific items in server shops with hypermerchant? As in, a user can sell wheat to the shop, but he can't purchase it from the shop. I know this can be done with signs and stuff but I wasn't sure if it could it with the NPC's and commands. Is this plugin compatible with 1.12? Yeah, I'll have an update with the new items soon too. It runs on 1.12 now though. Also, thank you for the immediate reply. The /hs command works as intended for me. It will only work if you are inside the shop and have the item in the players hand. And the player must have permission "hyperconomy.use". If it still does not work.. is there any stack trace in the console? I don't think any "promises" were made. As far as I know all of the features work. Have you tried the latest development build? What version of spigot are you using? I'm not sure what you're referring to about the /hs /heldsell command. That comment was over 2 years ago. Are you still having a problem with it? HyperConomy already has a similar help. Just type /hc I still need to add player shops and banks, but the basic commands are there. There are a lot of administrator commands, but for anyone that's an admin it's not too difficult to click on the commands page here. Many of the more complex commands have long descriptions that wouldn't fit well in the Minecraft chat. I'm working on a large update, but I have a lot going on right now. Hopefully I'll have some more time soon. I'd like to update the documentation. Let me know if you have any specific suggestions about making things more clear. I am 8 versions behind because Buildtools does not quit understand that it has to update.